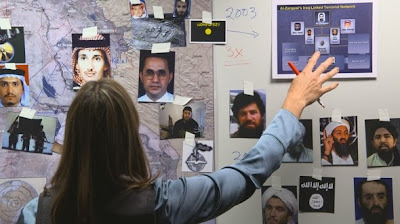 MANHUNT is a must-see documentary for anyone who has an interest in the rise of Al Qaeda, 9-11, and the USA's response to that. Which, let's face it, should be everyone who cares about the world in which we live. It's a scrupulously fair, brilliantly compiled documentary that has somehow gained access to the very people who analysed and researched Al Qaeda, and some of the military who had to deal with the situation on the ground. War correspondent and film-maker Greg Barker manages to get access to everyone you'd want to hear from - directors of the CIA, Stan McChrystal, the actual analysts who were hunting down Bin Laden from back in 1995, the FBI Jordan chief who conducted interrogations, the CIA men in charge of Black Sites. And what's more, Bergen gets them to talk - candidly - about what they did, and the morality of it. He doesn't edit to a politicised angle but let's the stories conflict where necessary. We have seemingly mild-mannered women talking about how they make peace with the fact that their analysis will lead to drone strikes. We have CIA men arguing that extreme interrogation techniques yielded results, and FBI men arguing the opposite. Bergen let's us decide. The picture that emerges is of, by and large, good men and actually, largely women. People who aren't evil power-crazed spooks but genuinely care about their country and doing a good job. People who's lives have been spent in service to bringing Al Qaeda down. They aren't the lone rogues of Homeland or ZERO DARK THIRTY. They are committed team players. They aren't the evil violent power-hungry men in black. They are conscious of the moral quandary they're in - some more than others, admittedly. You come out of it with a respect for their work, but also a sense that whatever that work has become - how frightening and futile the increase in drone strikes - it wasn't a deliberate power grab but something that happened organically and perhaps without the people who were at the centre of the chaos of the manhunt truly realising until it was fully manifest. But that's all the more reason for us to sit back and watch a documentary like this and think about where we've come and whether we're okay with that - essentially the plea of Stan McChrystal. This documentary is the first step in that process of self-reflection and is absolutely essential viewing. MANHUNT has a running time of 90 minutes. MANHUNT won a Primetime Emmy for Outstanding Documentary or Nonfiction Sepcial. It played Sundance 2013 and was shown earlier this year in the USA.